Most brake rotors get resurfaced when old, worn brake pads are replaced. 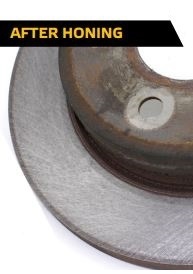 By the time a vehicle needs a brake job, the rotors may have grooves or areas of wear from the rubbing of the old pads. If a brake rotor has an uneven surface, the new pads won’t make contact with the rotor at the proper angle – and squeaking or squealing may result. Even with new OEM or aftermarket rotors, a factory finish that’s less than ideal may cause brake noise. To improve the surface finish of brake rotors, auto mechanics trust the Flex-Hone® for Rotors tool from Brush Research Manufacturing (BRM). Named an Undercar Digest Magazine Top Ten Tool for 8 years in a row, BRM’s rotor hone imparts a non-directional surface finish where “scratches” on the rotor’s surface extend in various directions. This “basket weave” finish doesn’t just help the new pads to seat properly. It lowers harmonic vibrations and reduces noise. BRM’s rotor hones use Flex-Hone® technology to impart the ideal surface finish to new and turned brake rotors. The tool’s abrasive globules or balls provide just the right amount of cutting action and are permanently laminated to flexible nylon filaments. In addition to imparting a smooth, non-directional finish, flexible honing removes surface rust and build-ups of brake pad glaze. Flex-Hone® for Rotors tools come in fine, medium, and coarse grits. Fine grits are used for light-duty vehicles or motorcycles. They’re also a good choice when a vehicle’s rotors are visible and a bright finish is desired. 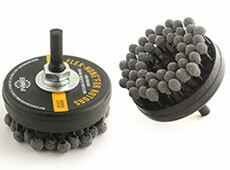 For passenger cars and light trucks, BRM supplies medium-grit honing tools. For heavy-duty vehicles, automotive flywheels, and brake rotors that have been poorly turned, choose coarse-grit Flex-Hone® for Rotors tools. As the Flex-Hone® for Rotors brochure explains, BRM’s rotor hones should be held securely in a chuck, collet, or similar holding device. Mount the disc rotor on a brake lathe, position all guards, and rotate the lathe between 125 and 210 RPM. Then chuck the Flex-Hone® for Rotors in a variable-speed electric drill motor or low-speed air drill, rotate the rotor brush between 300 and 600 RPM, and bring the brake hone into contact with the metal surface at a slight angle. When using the Flex-Hone® for Rotors tool, work in towards the center and out to the edge of the rotor face, applying light but uniform pressure. Dwell time against the part – and not excessive pressure – is what produces the desired surface finish. Use the Flex-Hone® for Rotors dry and work the brake hone for just 15 to 20 seconds at a time, typically 10 – 15 seconds clockwise and 5 – 10 seconds counterclockwise. To avoid overheating, do not dwell for longer periods of time. Get the Guide. Go to the Shows. Are your ready to learn more about brake rotor resurfacing? To get started, click the button below to download the Flex-Hone® for Rotors brochure. Then, if your tradeshow plans take you to two of the biggest events of the year, meet Team BRM at SEMA 2016 or at PRI 2016.